BROWNSVILLE — Melanie Mascorro of Harmony Science Academy in Brownsville credits a combination of word study, Spanish grammar and assertiveness for helping her advance to this year’s 90th annual Scripps National Spelling Bee in Washington, D.C.
Melanie qualified for the national bee by correctly spelling transept at the Rio Grande Regional Spelling Bee on March 4 in Weslaco. Transepts were part of mediaeval Christian churches, which were made in the shape of a cross to remind people of Jesus’ crucifixion, according to a quatr.us study guide of mediaeval architecture. The national bee is next week, with the finals on June 1 to be broadcast live on ESPN. 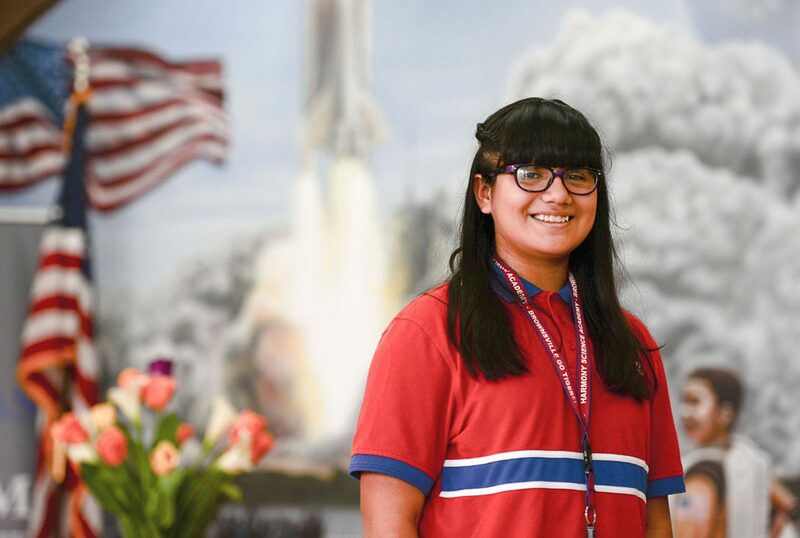 Melanie departs Sunday on an all-expenses-paid trip to the contest as the guest of AIM Media Texas, which sponsors the regional bee and owns The Brownsville Herald, The Monitor in McAllen and Valley Morning Star in Harlingen. She said she’s been preparing for the national bee in much the same way, studying with her big sister, Ilse Moscorro, a junior at BrownsvilleEarlyCollegeHigh School. Melanie said she learns words by first learning the definition and then how they’re used in sentences. “When I’m not very optimistic, she’s the one that tells me I can do it, that I’m going to win,” Melanie said of her sister. Melanie also said she uses a piece of advice from her grandfather, who told her to take deep breaths when spelling the words she’s given to give her mind more oxygen to think straight. Melanie won the sixth-grade spelling bee at her school and then the school-wide contest. When Melanie and her mom, Perla Rocha, and brother Miguel Moscorro fly Sunday out of ValleyInternationalAirport, it will be Melanie’s first time flying. Of the 291 spellers who qualified for the contest, 138 are female and 153 are male. Melanie will be contestant No. 260 when the contestants start spelling. The preliminaries will be broadcast live on ESPN3 on Wednesday. The finals Thursday will be on ESPN2 starting at 10 a.m., and on ESPN starting at 7:30 p.m.